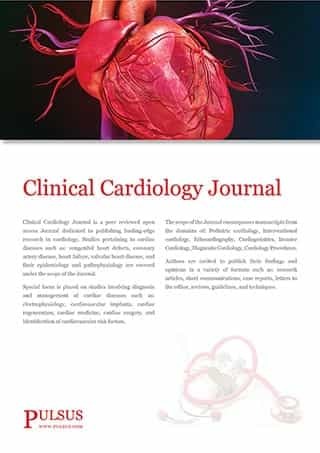 Clinical Cardiology Journal is a peer reviewed open access Journal dedicated to publishing leading-edge research in cardiology. Studies pertaining to cardiac diseases such as: congenital heart defects, coronary artery disease, heart failure, valvular heart disease, and their epidemiology and pathophysiology are covered under the scope of the Journal. Special focus is placed on studies involving diagnosis and management of cardiac diseases such as: electrophysiology, cardiovascular implants, cardiac regeneration, cardiac medicine, cardiac surgery, and identification of cardiovascular risk factors. The scope of the Journal encompasses manuscripts from the domains of: Pediatric cardiology, Interventional cardiology, Echocardiography, Cardiogeriatrics, Invasive Cardiology, Diagnostic Cardiology, Cardiology Procedures. Authors are invited to publish their findings and opinions in a variety of formats such as: research articles, short communications, case reports, letters to the editor, reviews, guidelines, and techniques.